Thank goodness the boy and I both love steak. It is one of my favorites and even though we don't have it very often, it always tastes SO good, especially with asparagus and nice red wine! 1. Use your fingers to press the pepper onto both sides of the steaks. If using top loin steaks, cut each steak in half crosswise. In a large skillet cook steaks in hot butter over medium heat to desired doneness, turning once. For tenderloin steaks, allow 10 to 13 minutes for medium rare (145 degrees F) to medium (160 degrees F). For top loin steaks, allow 12 to 15 minutes for medium rare to medium. Transfer steaks to a serving platter, reserving the drippings in the skillet. Keep warm. Remove skillet from burner and allow to stand 1 minute. 2. For sauce, combine brandy and beef broth (or all beef broth); carefully stir into drippings in skillet, scraping up crusty browned bits. Stir in whipping cream and mustard. Bring to boiling. Boil gently, uncovered, over medium heat for 5 to 6 minutes or until mixture is reduced to 1/2 cup, stirring occasionally. 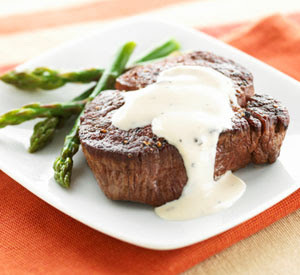 Spoon sauce over steaks to serve.